They’re known for their suits, but SuitSupply also makes just about everything a guy might wear, and that includes, of course, shirts. While we will be reviewing their dress shirts soon, first I thought we would take a look at their more casual button-down shirts. Do they bring the same quality and fit that their suits do? We ordered a light blue OCBD and a plain brown shirt to find out. Blue Striped OCBD — $99: Super nice overall look and appearance, and the fabric is thick without being stiff. This is definitely feels and wears like something leagues above what you might find at Gap. I wouldn’t say that it’s totally night and day — or that it’s necessarily worth the much higher price; see below — but it’s noticeably a nicer, better shirt, hands down. The fabric is 100% “luxurious Egyptian cotton by Albiate.” The buttons are super nice, and firm. And there is an awesome collar roll to the collar as well. In all, this is a mighty fine OCBD. Brown Textured Shirt — $99: Mostly all the same good things here. 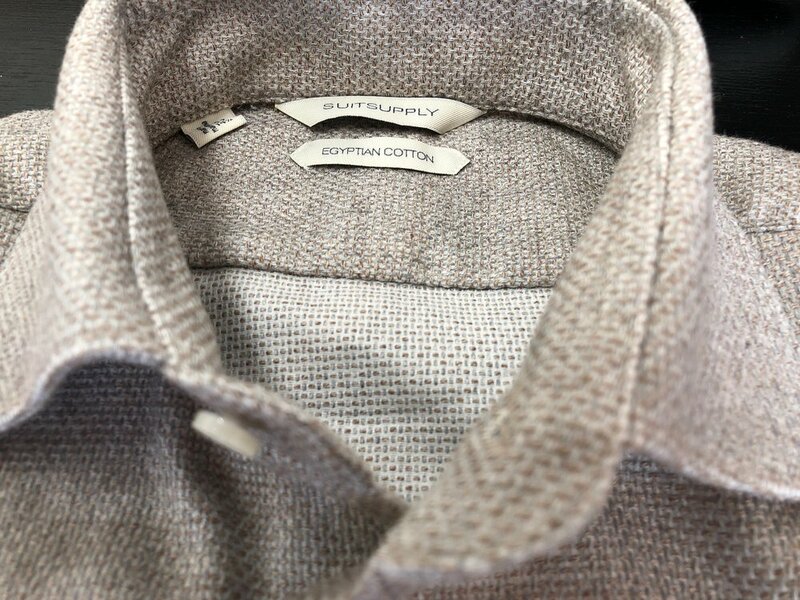 Fantastic construction, nice, comfortable and rich-feeling fabric made from 100% “Egyptian cotton by Monti.” In fact, this fabric has quite a texture to it, but still feels smooth on the inside. It’s somewhat hard to explain exactly what the texture is — something like a basket weave, honestly — but it looks really nice. It’s exactly the sort of thing you go to SuitSupply for. It’s not common, and not the sort of thing you can readily get from other companies. It’s unique and classy. Bottom line: Both of these shirts are extremely well made and constructed. The fabrics on both are rich and weighty (in a good way), and all the details are there. When it comes to SuitSupply, you can expect details like collars (or jacket lapels) to be more prominent. SuitSupply makes some of the nicest spread collar shirts I have seen. For these more casual shirts, SuitSupply went with, of course, a button down on the OCBD, and only a semi-spread collar on the brown shirt. The OCBD is a classic, blue and white striped OCBD that looks great — not much to say here. The brown shirt, though, is more unique and I really like the look of it. With the right tie, this is the sort of shirt that would go fantastically with jeans and a navy blazer. Without a tie or top layer, though, the collar sits kind of strangely, and so it is not suited to truly casual wear, like the OCBD. Bottom line: Both shirts are very nicely detailed, and look great when worn with outfits that suit them. The shirts are high quality, and they look it to, from top to bottom. Here, like is so often the case, things start to go off the rails. While it makes sense that SuitSupply would have a different cut for a more casual shirt, it does not make sense that within their casual shirt line, each shirt might very well be cut differently. They truly do expect you simply to order, and how that whatever they did with the fit was right for you, and if not, return it. Yes, they do offer free shipping both ways, but this seems… dumb? I mean, why do this? Why not standardize and explain their shirt fits, just like they do with their suits? Consider what happened here: both of the shirts I ordered were labeled as “Extra Slim Fit,” but they fit radically different from one another. Not only that, but I ordered the OCBD in a size 15.00”, and the brown shirt in a size 14.50”, yet the brown shirt fit longer, wider, and overall larger than the OCBD. How does that make sense??? Needless to say, neither of these shirts fit me very well. Both pulled in strange places across the chest or waist. The OCBD was much too short and tight, while the brown shirt was a bit too long in the body, and oddly hugged my back. In truth, the collar was a bit snug even on the 15.00” OCBD, and so it’s likely that a 15.50” might have fit me better in that particular shirt, though I am far from sure of that. Given the fit inconsistency problems, these are hard to recommend. However, as is always the case when it comes to a bad fit on an otherwise great garment, if these happen to work for you, they are truly solid shirts that are very well cut (high armholes, not too long, etc.). They offer free shipping both ways, and they also have stores in many major cities, so there is little downside to giving them a shot if you’re interested. Still, at around $100 per shirt, if you can hold off until their outlet sales, you would do a lot better. While compared to somewhere like Bonobos, $100 is not beyond ridiculous to pay for a shirt, it still is very high when you can get high quality custom shirts for the same price (reviews forthcoming on some options, so stay tuned). I guess to sum up: If they fit you well, and the $100 price tag does not scare you off, you won’t be disappointed.